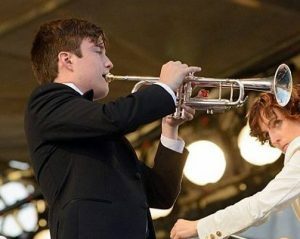 Guest trumpeter, Ben Parker first encountered the instrument in 2006 in a small Turkish music store. Since then he has improved substantially and has dedicated himself to music. He became seriously interested in music in 2012 while studying with Timothy Quinlan in Victoria. In 2016, he went to McGill for a year to study with the principal trumpet of the Montreal Symphony, Paul Merkelo. The following year he started studying physics at UBC, but the pull to music overcame his interest in science. This year he has returned to pursuing music and is currently studying classical trumpet performance under Merrie Klazek at the University of Victoria. Some of the highlights of his musical career to date include being a soloist with the Victoria symphony at Symphony Splash, winning the solo brass category at the Canadian National Music Festival, and playing in various local pop bands for festivals and recordings.